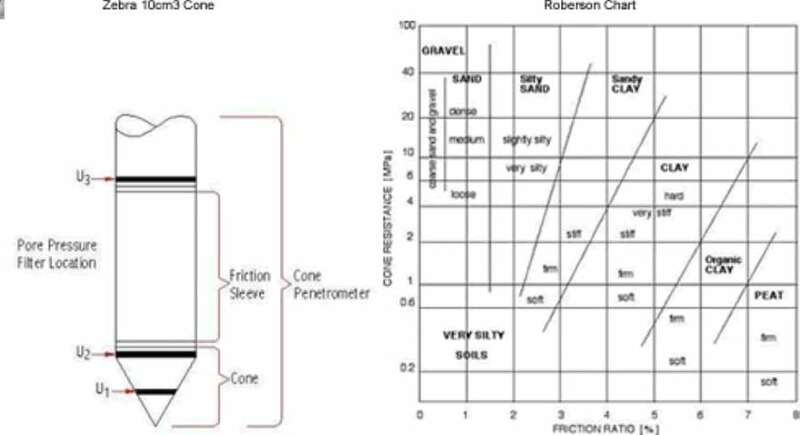 The cone penetration test (CPT) is a common in situ testing method used to determine the geotechnical engineering properties of soils and assessing subsurface stratigraphy. The test is also called, Dutch Cone test. Due to its simplicity and efficiency, the cone penetration test is one of the most commonly accepted and used in-situ testing methods in geotechnical investigation worldwide. The cone penetration test (CPT) is a common in situ testing method used to determine the geotechnical engineering properties of soils and assessing subsurface stratigraphy. The testing apparatus consists of an instrumented still cone having a tip facing down, with an usual apex angle of 60° and cross-section area of 1000 mm2. The code is attached to a internal still rode than can run inside a outer hollow rod, which itself is attached to a sleeve. In the more elaborate CPT instruments, the cone and the sleeve (attached to the outer rod) can move separately. 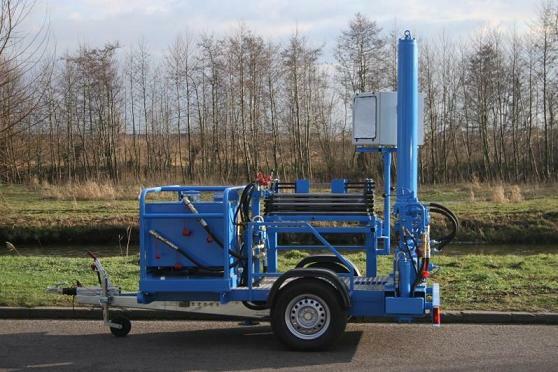 The Cone penetration test can be carried out from the ground surface with a need for a borehole. The test is carried out by first pushing the cone into the ground at a standard velocity of 1 to 2 cm/s while keeping the sleeve stationary. For any depth, the resistance of the cone, called cone penetration resistance q_c , is recorded using the force probes provided for this purpose in the cone. 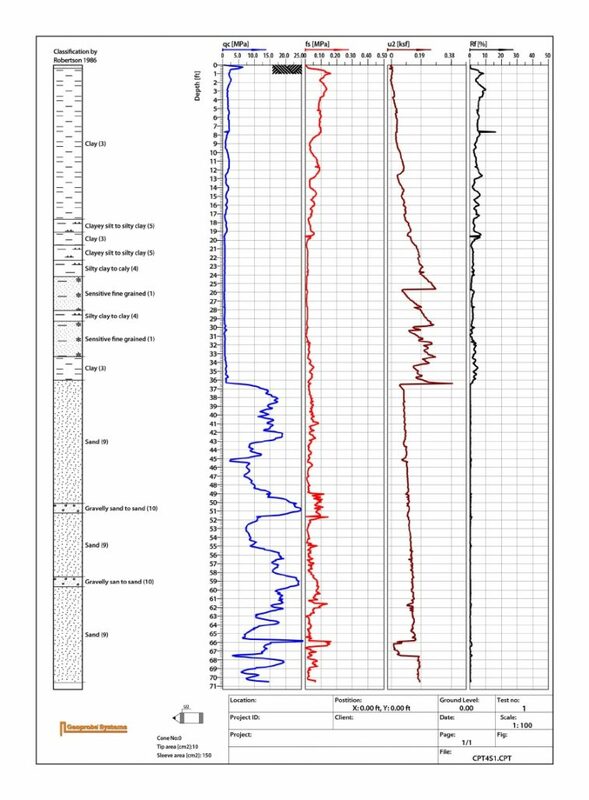 Then the cone and the sleeve and moved and penetrated together into the soil and the combined cone and sleeve resistance, indicated by q_t , is recorded at any depth using tension load cells embedded in the sleeve. This procedure is repeated and the measurements are made at regular depth intervals during penetration. 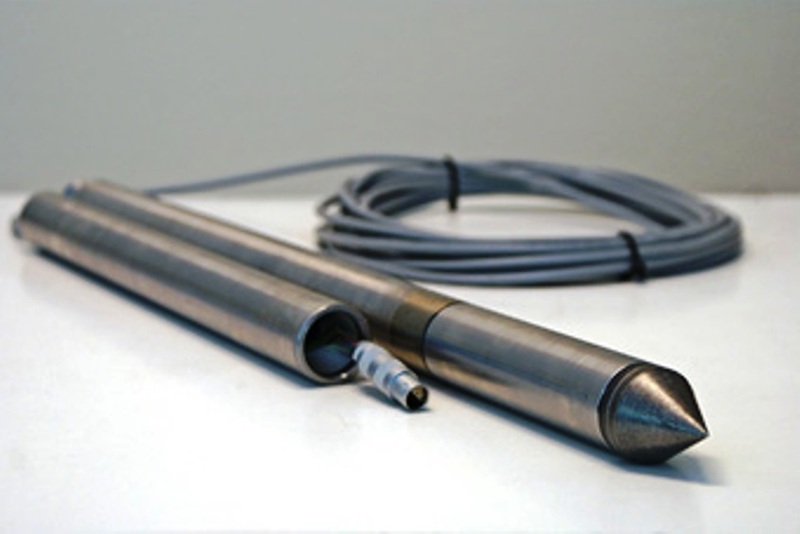 In addition to the stress on the tip and the sleeve friction, the typical CPT probe measures as well the porewater pressure. Some equiped CPT probles are also able to measures shear wave velocity and temperature. 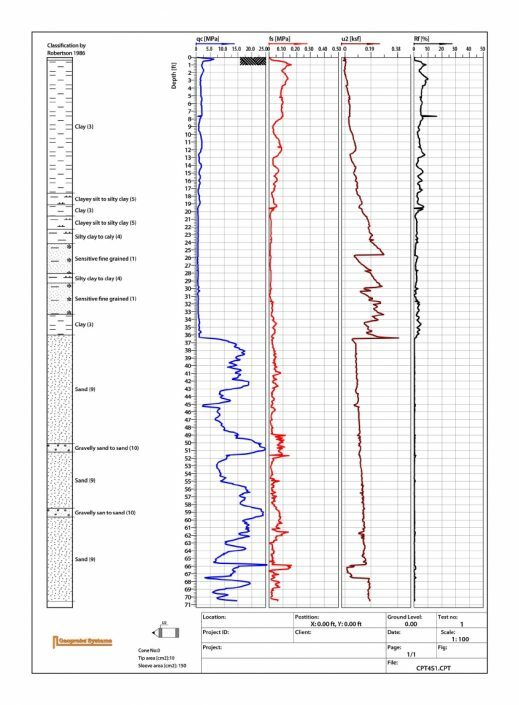 The cone penetration resistance values can be then correlated to shear strength parameters using proposed empirical curves. 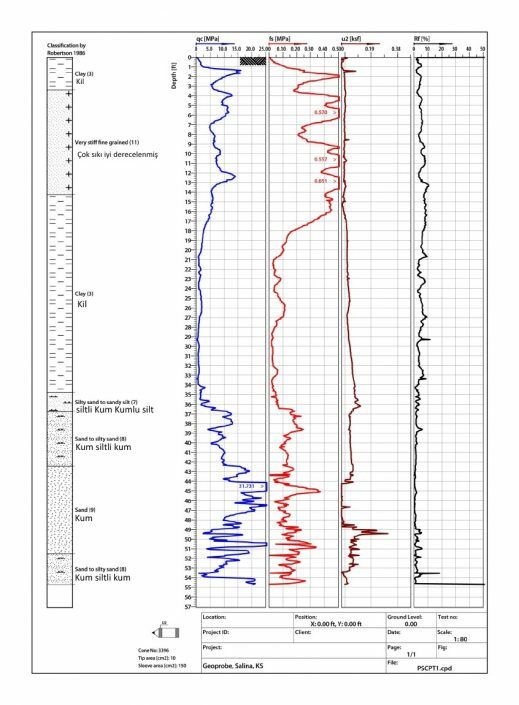 There are also some design methods associated with CPT results which directly use the CPT results to estimate the settlement is soils under a given pressure.